Suction Excavator Solutions provides air tooling to fracture, pulverize and displace porous and semi-porous soils, yet leave nonporous objects unaffected. The air tooling excavates soil without risk of damaging buried utilities. The selection of the appropriate tool should be governed by the soil class, the nature of the job site, and the porosity of the ground. Our air tooling employs converging/diverging nozzle technology to accelerate compressed air to supersonic speed (up to 1500 mph). The high velocity air stream travels approximately 4 inches from the distal end of the Soil Pick – “the cutting edge” – before decompressing to atmospheric pressure with sufficient violence to pulverize and displace soil. Non-conductive, non-sparking tools are the perfect solution when working in environments that may be gas enriched or are in close proximity to live electric lines. This lightweight ergonomic tool is designed for operation over extended periods of time with minimal operator fatigue. The Soil Pick is tested to 40,000 Volts and has zero hand/arm vibration. The use of this air jet knife will not cause any damage to buried cables, utility lines, and roots. A special nozzle has been designed to increase the velocity of the air flowing through the outlet at the tip. This sharp air jet allows to loosen certain points of the ground. 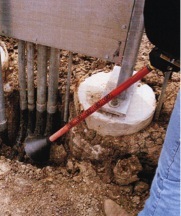 This makes this tool especially suitable for operations in the soil directly around buried cables, pipes and roots. Extension pieces and bent blowpipes enable work in deeper depths as well as under cables and pipelines to be performed. This pneumatic air jet lance is used to assist with non-mechanical excavation of materials for depths of 1m or more. It provides a safe method of working around pipes and cables by blowing high pressure air through a nozzle into the ground to loosen material. The lance is operated via a slide on/off valve mounted at the top for operator ease. The special pneumatic tool with 150mm wide spade is most efficient in light to medium soil. Its narrow and light-weight characteristics (6kg) makes it ideal in narrow excavations where space is restricted. Suction Excavator SolutionsWhy use air tooling?